Over 40 Youth Delegates from 30 countries will attend the 72nd Session of the General Assembly in New York. Youth Delegates will form a part of their country’s official delegation including to the Third Committee, the arm of the General Assembly that deliberations social, cultural and humanitarian issues. Youth Delegates to the United Nations are advocates for their fellow young people and provide input to their delegations on youth-related topics and concerns. Youth issues will be discussed during the Third Committee under the agenda item titled “Social development, including questions relating to the world social situation and to youth, ageing, persons with disabilities and the family.” Many youth delegates give statements on social development issues, including youth, and their speeches can be seen on UN Web TV. Meet the Youth Delegates for the 72nd Session of the United Nations General Assembly here. 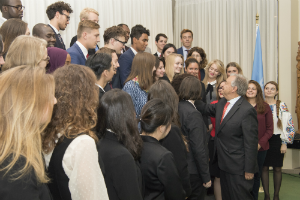 Find out more about the Youth Delegates Programme here.